The Pittsburgh Riverhounds defeated the New York Red Bulls II, 3-0, before a lively Fourth of July crowd at Highmark Stadium in one of their strongest performances of the year. Rob Vincent scored his league leading 10th and 11th goals of the season and Tyler Pasher added a header from a trademark Matt Dallman cross to complete the scoring to help move the Hounds (6-5-4) into fifth place in the USL’s Eastern Conference standings past the Red Bulls II (6-6-4), ending New York’s three game win streak. “On both sides of the ball, from start to finish, it definitely was our best performance,” said Josh Rife, who filled in as the head coach on Saturday night, after Mark Steffens was sitting out a one-game suspension after being ejected for disputing a call last week in Rochester. The Hounds broke a scoreless tie in the 42nd minute thanks to Vincent’s deadly accuracy from distance. After receiving a quick pass from Max Touloute who won the ball back about 30 yards from goal, Vincent saw an opening — taking two touches, and with plenty of room to shoot, the Liverpool, England native sent a laser that bent toward the upper right corner of the goal. “There is not another player in this league I would want right now to put the ball back in the net,” said Rife praising Vincent’s goal scoring prowess. In the second half, Rife began to use substitutions that would help seal the win as play really began to open up for the Hounds. Two of those subs would hook up for the game’s second goal. Shortly after making his first appearance in nearly a month, in the 72nd minute, Matt Dallman took a throw-in — finding Kevin Kerr near the corner flag. Kerr immediately played the ball back to Dallman who sent a well placed service into the center of the box that Tyler Pasher leaped between two New York defenders to head into the right side of the goal for the 2-0 lead. “I got the ball, and thought, I just want to get it in position,” said Dallman, who led the USL in assists in 2013. Vincent capped the scoring with another goal — as another second half substitution, Drew Russell made a deep run, and cut back a pass to Vincent who while moving to his right took a low shot toward the left side past Red Bulls goalkeeper Santi Castano that pinged off the post and barely crossed the goal line to give the Hounds the three goal advantage. Rife was especially pleased with the performance of the players who entered in the second half. “It’s one of the issues that we’ve had as a team has been with guys coming off the bench and not having an impact like we hope. But tonight, while maybe the momentum might have drifted away a bit in the beginning of the second half, our subs gave us a lift,” said Rife. It was the second consecutive shutout home win for the Riverhounds, as both clean sheets were recorded by first-year goalkeeper Calle Brown, who made four saves. Both central defenders, Anthony Arena and Fejiro Okiomah — along with Sterling Flunder and Mike Green, and later Dallman, the Riverhounds back four worked well throughout the night to minimize the Red Bulls II opportunities — keeping most of their 12 shots from difficult angles and distances. For Dallman, it was his first assist of the season, as he’s very pleased with how the team has come along as he’s sat much of the season due to injuries. “This is a young team. Hopefully I can use my experience to help where ever needed,” said Dallman, who along with Flunder are the oldest players on the squad at 30 years old. The Riverhounds return to action with a rare mid-week road encounter at Toronto F.C.II on Wednesday night (7 p.m. kickoff), then stay in Canada to take on F.C. Montreal on Sunday (4 p.m. kickoff). Calle Brown (Goalkeeper) – 6 – Wasn’t really tested, but was busy handling long shots, and did well early with foot skills when NY’s high pressure forced the Hounds to play the ball back to Brown repeatedly. Has great leg strength with some really long goal kicks. Mike Green – 7 – the versatile Green started at right outside back, and was terrific in containing Marius Oberkop, while helping create chances with pinpoint passes. When Dallman entered, moved to attacking MF, where he’s played more minutes this year. 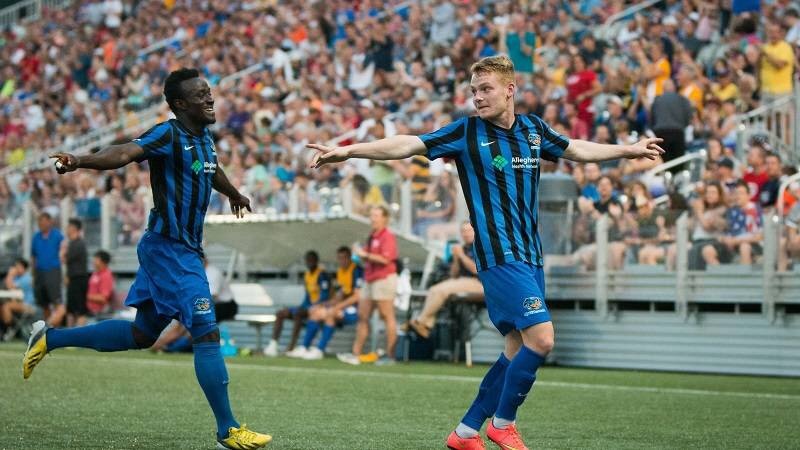 Sterling Flunder – 6 – up to appearance #118 in a Riverhounds uniform. Mostly solid using his experience in limiting the younger Red Bulls forwards chances. Anthony Arena and Fejiro Okiomah – 7 – very solid night for both. Okiomah made a nice run in first half that set up Vini Dantas who missed shot. Stephen Okai – 6 – a typical, quietly efficient night for Okai who played well along side Vincent. Rob Vincent – 9.5 – made the most of his opportunity with terrific goal toward the end of the first half – and secured his league lead with the game’s third goal to keep NY at distance. Played holding midfield role and was just as good in that role helping fortify the Riverhounds shape and supporting the defense on a night he scored two goals. Lebo Moloto – 5 – return to the line-up — struggled a bit at first with the much bigger Red Bulls back line, but settled down and made some nice passes. Kevin Kerr – 7 – was his usual tireless self — getting a few nice opportunities on long balls but did a nice job to set up the Pasher goal by simply playing the ball back to Dallman for the cross. Max Touloute – 5 – were times he was standing on left side calling for ball, but had a few nice runs in box. Had the assist – in finding Vincent for the game’s first goal. Vini Dantas – 5 – had three decent chances — and each time sent ball higher over the bar. But he did play well when redistributing the ball and holding the ball up against a big, strong back line players of the Red Bulls II. Tyler Pasher – 7 – when he enters the game he immediately has an impact with his speed. Coaching staff likes having him in left attacking MF spot, where he was able to finish with nice leaping, athletic header. Drew Russell – 6 – making a claim for starting role at striker when Hounds need more athletic presence. Made nice run and cut back pass to set up Vincent’s last goal. Matt Dallman – 7 – that was a classic Matt Dallman cross. Right on the money and sets up a big second goal after coming off the bench moments before. Shades of that first game ever at Highmark Stadium. Definitely gave his team a needed lift. “We are looking at how we do every seven games. There are four seven game stretches — and we’re off to a good start in this seven game stretch,” said Vincent on his team’s approach to the rest of the season as they contend for playoff spot.